MONTREAL – Matrox® Graphics Inc. and Matrox Video will be sharing booth 4053 at InfoComm 2015 (Orlando, June 17-19). Matrox Graphics Inc. will present a video wall demo featuring 4K-over-IP to give attendees a preview of what’s up and coming. Matrox Graphics will also demonstrate the award-winning C-Series™ multi-display graphics cards, Maevex™ Full HD over IP H.264 encoders/decoders, the field-proven Mura™ MPX video wall controller boards, and zero-latency Avio™ fiber-optic KVM extenders. Matrox Video will showcase the award-winning new Monarch™ HDX dual-channel H.264 encoder for broadcast streaming and recording as well as the VS4Recoder Pro™ multi-camera event recording app. In addition, Ron Berty, business development manager at Matrox Graphics Inc., will host an InfoComm 2015 Manufacturers’ Training titled “Low bit rate 4K encoding over IP” on Thursday, June 18 at 3:00PM. In this seminar, he will discuss the capture, encoding, low bit rate streaming, switching, recording, decoding, display, and management of AV sources and consumption nodes such as projectors, commercial displays, tablets, and PCs. Matrox C-Series multi-display graphics cards let signage integrators build high-impact display walls that are reliable and easy to install. C-Series provides outstanding video performance with advanced multi-monitor capabilities and EDID management via intuitive software to simplify both portrait and landscape installations. The cards feature 2 GB of on-board memory and secure mini DisplayPort connectivity. Matrox C680 supports up to six 4K/UHD displays. More displays can be supported by inserting two C680 cards into a system. The board-to-board framelock feature ensures synchronization of all displays to reduce tearing on digital signage and video walls. Matrox C420 is ideal for use in the small-form-factor systems needed in tight signage setup spaces. It’s also the fastest quad card with passive cooling, for increased reliability and silent operation. Matrox Maevex H.264 encoders and decoders deliver exceptional quality AV streaming at low bandwidth over standard IP networks for display or for storage anywhere on the LAN. Maevex encoders, priced at only $999 US (MSRP), can be combined with Maevex decoders or a third-party software decoder to stream up to Full HD digital signage, education and training materials, camera footage, desktop screen capture and other AV content to one or more displays and to collaborative video walls. Maevex encoders can also be used to record live AV content to network-attached storage (NAS) or network-shared drives at resolutions up to 1080p60. The zero-latency pass through allows realtime monitoring or connection of another device to stream at the same time as recording. Maevex units come bundled with Matrox PowerStream™ software, allowing for easy remote device management, stream switching and streaming/recording parameter adjustment, including user-definable bitrates between 100Kbps and 25Mbps. An API is also available for software developers who want to add Maevex device control to third-party applications. Matrox Mura MPX Series capture and display boards feature flexible inputs and high-quality outputs allowing AV integrators, system builders and equipment manufacturers to easily and cost-effectively build custom, high-density video wall controllers with up to 56 HD inputs and 56 HD outputs. Exceptional-quality scaling, switching and compositing of source content including HDCP feeds are easily managed through intuitive software control options including Matrox MuraControl™, third-party software and simple integration with existing AV control systems. Rich transitions and eye-catching effects can be applied to both live and file-based content using the latest Mura Network API-a platform that software developers have used to build their own powerful video wall control solutions for Mura-based video walls. 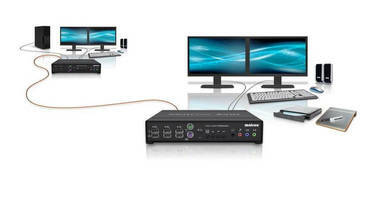 Matrox Avio F125 fiber-optic KVM extenders separate dual HD or single 4K/UHD video, keyboard, mouse, stereo analog audio and USB 2.0 devices from a computer, providing real-time control of high-performance workstations located up to 6 miles away. The transmitter/receiver pair extends two single-link DVI (2x1920x1200) or one dual-link DVI (2560x1600 or 4096x2160) video, and multiple high-speed USB 2.0 compliant devices from the host computer by up to 1312 ft (400 m) over multimode cable and 6.2 mi (10 km) over single-mode cable. Avio F125 stands out for its ability to transmit all signals with zero compression and zero latency on a single duplex LC-LC fiber-optic cable. Matrox Monarch HDX is a compact, easy-to-use, dual-channel H.264 encoding appliance. Designed for complete workflow flexibility, Monarch HDX features 3G-SDI and HDMI inputs with frame synchronization to compensate for unstable sources. Two independent H.264 encoders provide redundancy or can be set to stream and/or record at individual settings. Monarch HDX is packed with features that make it ideal for broadcasters, event producers, medical facilities, CDNs, educational institutions, houses of worship, corporate communicators and legal videographers. From any SDI or HDMI input source such as a camera or switcher, Matrox Monarch HDX generates two H.264-encoded video streams at bitrates from 200 Kbps to 30 Mbps. Powerful scaling, deinterlacing and noise reduction engines ensure only the most pristine images are sent to the encoders. For streaming purposes, the encoders use either RTMP or RTSP protocol to deliver live streams to local or cloud-based media servers. In recording applications, the encoders write MP4 or MOV files to local USB drives, SD cards or network-mapped drives for post-event editing or archiving. An additional, dedicated H.264 encoder provides remote preview of the input.